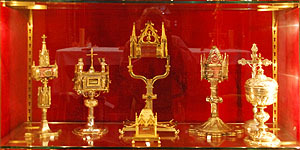 From the sacristy of the Santo Tomás church in Ávila. 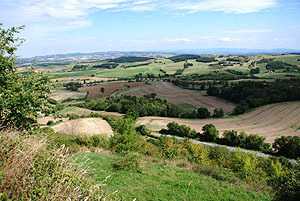 Fanjeaux is located in the Aude Department of the Languedoc, west of Carcassonne. 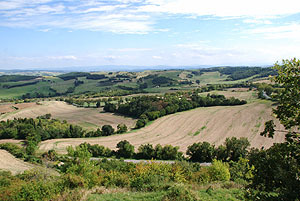 In the medieval period Fanjeaux was culturally and strategically important, overlooking the plain of Lauragais, and connecting it to the Razes. 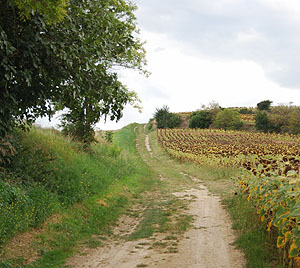 The most direct road from Carcassonne passed through Fanjeaux on its way to Mirepoix, an important market town. 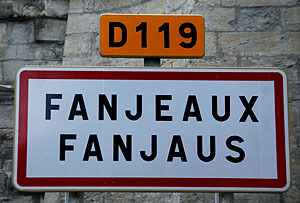 Fanjeaux, like Carcassonne and Mirepoix, was a centre of Cathar belief. 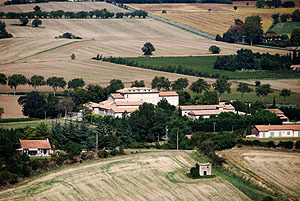 Two different roads connect the town of Fanjeaux to the nearby convent of Prouille (Occitan Prouilhe). 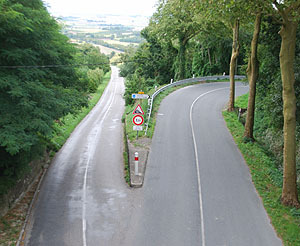 Signposts direct drivers to a modern tree-lined road that curves its way down the hill to Fanjeaux. This road is therefore used by tourists. A more direct smaller road is nominally for farm vehicles, but all the locals use it, so it is far busier than the main route. In Roman times a temple to Jupiter (Jove) stood at the highpoint of the town, next to a lake. (Lakes on the top of hills are not common phenomena and this one was presumably considered sufficiently remarkable that it was attributed to the King of the gods). 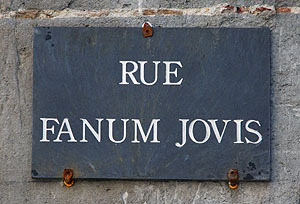 The modern name of the town comes from its Occitan name, itself derived from the Roman name, Fanum Jovis ("Temple of Jove"). Both temple and lake are commemorated in street names. 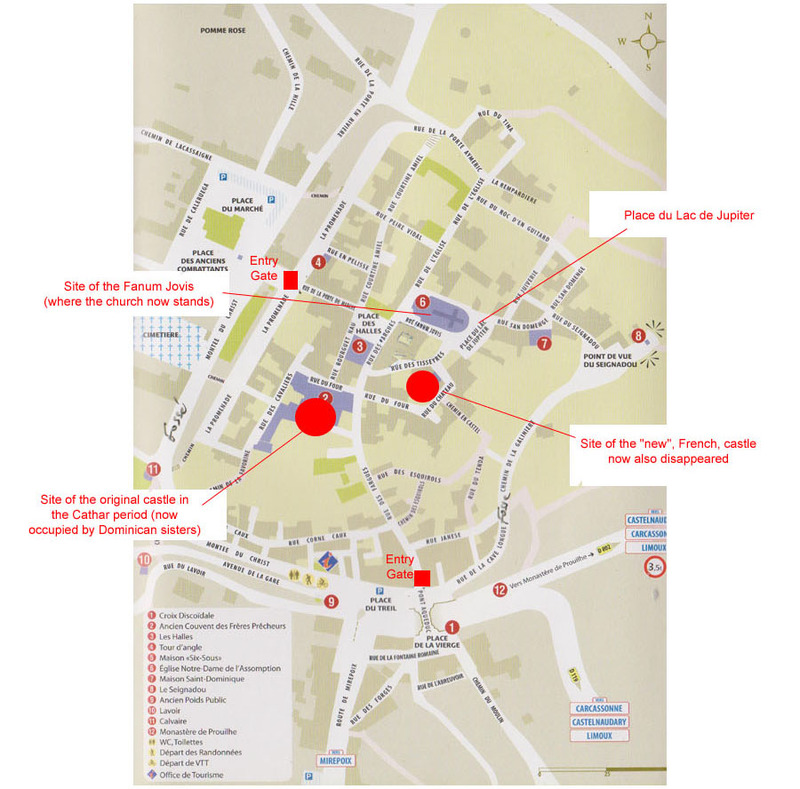 A possible vestige of the Roman period are the four medieval town gates, placed roughly north, south, east and west, a typical Roman arrangement. 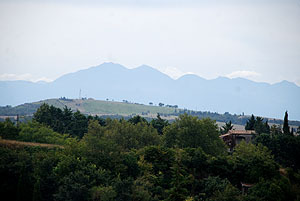 In the medieval period Fanjeaux was a large castrum, still with its four entries. It was surrounded by a moat and defended by a rampart with fourteen towers. Two of the original four entries today serve as reminders of the medieval gates which controlled entry into the town. Like most Languedoc castra it had a large castle within its walls, almost nothing of which remains today. 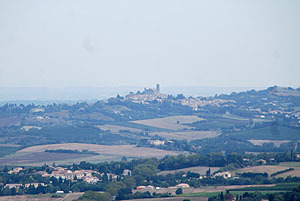 The castle of Fanjeaux, "which is like a paradise" is mentioned the Occitan troubadour Peire Vidal in the late twelfth century in his song "Mos cors s'alegr' ". The original castle was built the north-western end of town and occupied by the Durfort family. Already ruined in the late fourteenth century, it has now completely disappeared. The site is occupied by Dominican sisters (Dominicaines de las Sainte Famille). Fanjeaux was a great centre of Cathar belief and home to around 50 Cathar families. 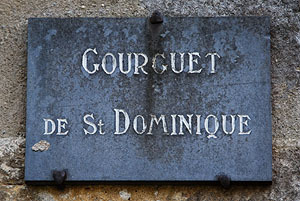 Two dominant coseigneurs were Na (ie Lady) Cavaers and Guilhem de Durfort. 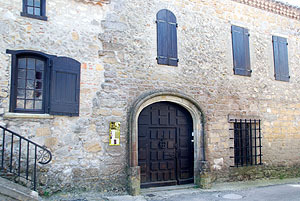 The town included houses for Cathar Parfaites, including one founded by Esclaremond de Foix. According to Catholic sources there were no fewer than ten houses of Parfaites here. In these houses women lived communally, living the ascetic celibate lives of Parfaites, offering education to children, food to the poor, medicine to the sick, shelter to the aged, and refuge to the persecuted. 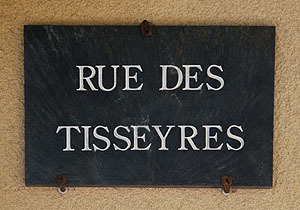 Textile workers ("Tisserands" or "Tisseyres") practised weaving, dyeing, etc and in addition were particularly active in promoting the ideas of Cathars (bon hominies or Good Men). 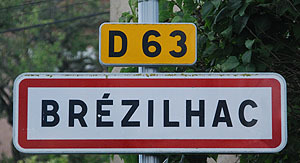 Textile workers were particularly active at Fanjeaux, and are commemorated in one of the road names. In 1193 Guilhabert de Castres, a Cathar bishop, settled in Fanjeaux, where there seems to have been no incumbent Catholic priest. 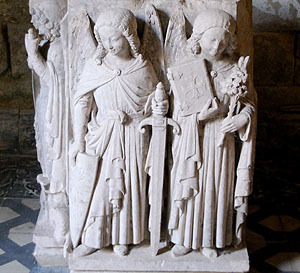 In a great assembly held in 1204 at Fanjeaux, presumably in the Hall of the Château of the Durforts, the Cathar Bishop Guilhabert de Castres conferred the Consolamentum on four noblewomen: Esclaremond de Foix and three women from the House of Durfort: Fays de Durfort (mother of Sicard and Pierre de la Hille), her daughter in law Aude de Fanjeaux (wife of Pierre de Durfort), and her close relative Raymonde de Saint-Germain (wife of Guilhem de Durfort). The ceremony was conducted in the presence of Esclaremond's brother, Raymond-Roger de Foix, Count of Foix. 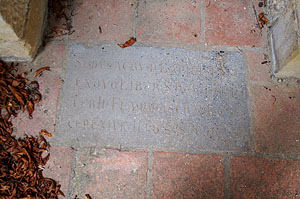 Esclaremond was responsible for the establishment of schools for girls and hospitals in the region. 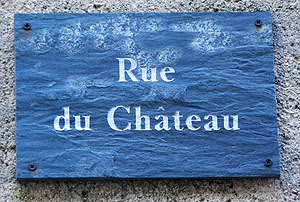 She and her sister-in-law Philippa famously ran a House for Parfaites at Dun in the Pyrenees, which functioned as a home for aged Parfaits and a girls' school. 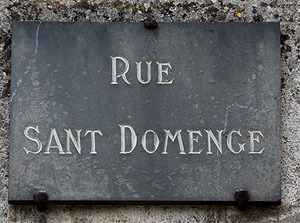 At the time of St. Dominic's arrival there seems to have been no parish priest at Fanjeaux. Indeed, not a few of the clergy themselves were tainted with the heresy (some of the more notable heresiarchs were apostate priests), and a very large proportion were ignorant, lukewarm, without courage or zeal. St Dominic's Country, Lives of the Friar Saints, p 49. One aspect of Catharism that horrified Catholics in the medieval period and well into the twentieth century, was the prominent role played by women. They enjoyed freedom and authority far in excess of what churchmen thought proper. 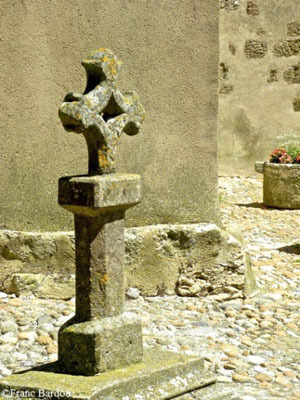 Cathar women were evangelists and apostles just as much as men. The part played by women in the heretic propaganda was enormous. Those of the upper class  such as Esclairmonde [sic] de Foix and Guiraude de Montreal  arranged meetings between the leaders, and took an active share in the Albigensian tactics, political as well as social. The peasant women carried messages and acted generally as go-betweens, "un-suspected from their very insignificance." The children often could remember no other care, no other instruction than that of the Parfaites. Madame, go to your spinning. This debate is no place for you. 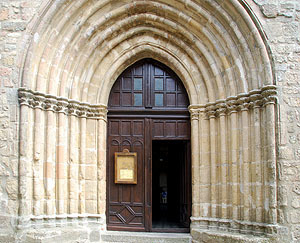 In front of an educated Occitan audience, familiar with a much greater degree of sexual equality, and aware of Eclaremond's reputation, this approach probably undermined the Catholic position even before the debate started. These debates were held in front of independent juries who voted at the end of the debate. 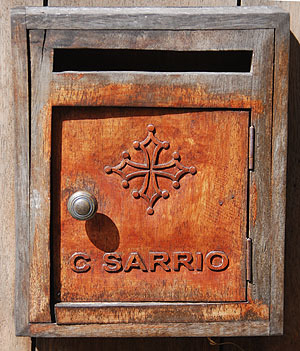 Surviving records, all Catholic, suggest that the Cathars generally won since the chroniclers restrict themselves to producing reasons to regard the vote as invalid or unfair, or complaining about the bias of jury members. This might explain why Dominic's reputation is not based on contemporary records of his success in converting Cathars by argument, but on a series of improbable miracles. The Colloquy of Montréal would be the last debate between the Cathars and the Roman Catholic Church. The Church recognised that a more robust approach was needed. 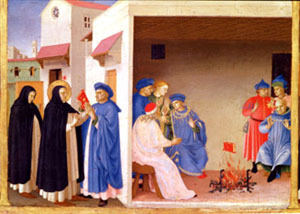 Saint Dominic, apparently having given up on voluntary conversions, decided that force was needed and set off for Rome. The following year Pope Innocent III launched the Albigensian Crusade against the Cathars of the Languedoc. The Albigensian Crusade was preached in 1208. The Crusaders left France in 1209 headed down the Rhone Valley to the Languedoc. The first cities to fall were Béziers and Carcassonne. After the fall of Carcassonne, their Viscount was imprisoned and soon afterwards he was dead. Some dependant towns surrendered without a fight. Among them were Fanjeaux as well as Albi, Castelnaudary, Castres, Limoux, Lombers and Montréal. Fanjeaux was taken over by the crusaders, forcing the Cathar preachers as well as many "believer" inhabitants to flee to other towns. 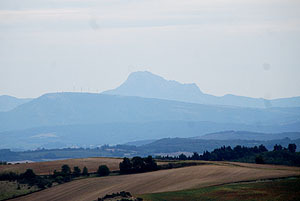 The Cathar Bishop Guilhem of Castres withdrew to the castle of Montségur, which was to become the last Cathar stronghold, and in which he died in 1244. 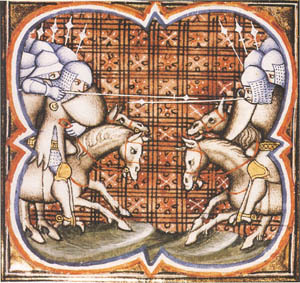 The new leader of the Crusade, Simon de Montfort, recognised the strategic position of Fanjeaux and immediately made it his headquarters. 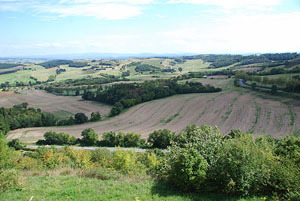 De Montfort was at Fanjeaux shortly before the Battle of Muret. As one Catholic source relates. Dominic de Guzman became Saint Dominic in 1233 twelve years after his death in 1221. Also in 1221 the Count of Toulouse retook Fanjeaux along with nearby Montréal. From 1303 a new castle was built in Fanjeaux, to the east of the parish church, The New Castle was a royal palace, where royal justice was dispensed. Only one of its towers, which housed the royal prison, still existed in the late seventeenth century. 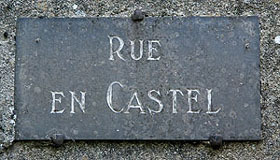 Vestiges still remain today near to the Rue du Château and the Rue En Castel. 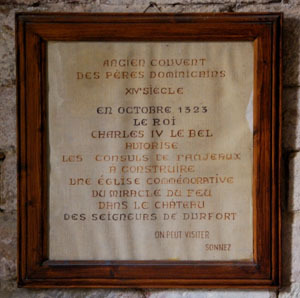 In October 1323, King Charles IV (le Bel) authorised the consuls of Fanjeaux to build a church in the old château of the Lords de Durfort to commemorate Dominic's book burning miracle (Le Miracle de Feu). As at the Ville Basse at Carcassonne and other towns deprived of their city walls, Fanjeaux provided rich and easy pickings for The Black Prince in 1355 when he ravaged the Languedoc. 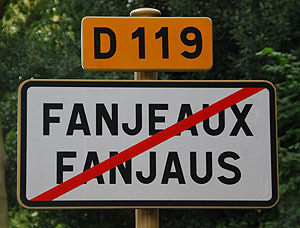 Fanjeaux was burnt to the ground. 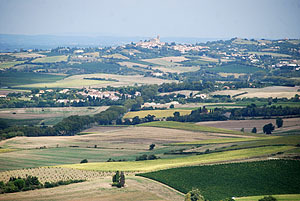 In the sixteenth century, the village experienced new prosperity through the cultivation of pastel, and several hotels particuliar in the town date from this period. 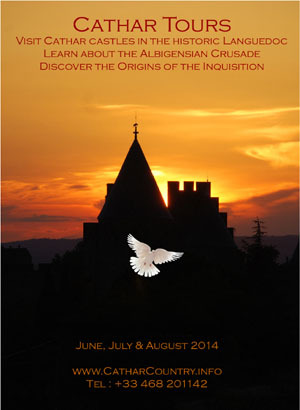 One of them the Hotel Gramont houses a photographic exhibition on the history of the Cathars. 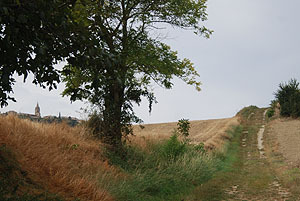 Northeast of the parish church, are the remains of the Chapelle des Penitents Blancs (White Penitents' chapel) built in 1596. 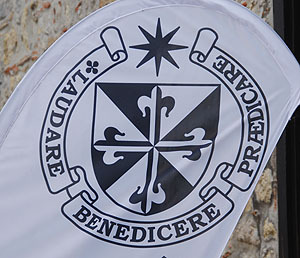 The Pénitents Blancs were Catholic fraternities, popular in France, Spain and Italy, many of them established around Dominican Convents. 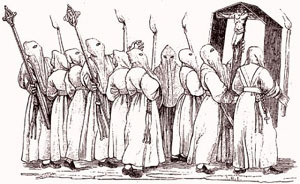 Penitents dressed in white hoods and robes. 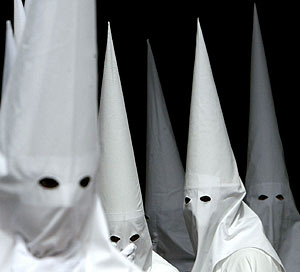 Hoods had just small eye-holes and robes had special flaps at the back which could be opened to expose the flesh. Penitents would then flagellate themselves, as Saint Dominic did, or sometimes each other, a practice known as "mortification of the flesh". Flails were often fitted with iron balls or blades in order to draw blood and maximise the pain and bloodflow. 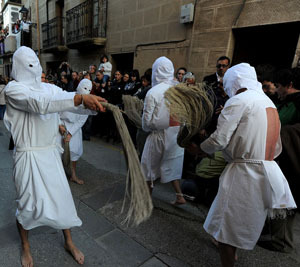 Flagellation was often carried out in public during Holy Week. 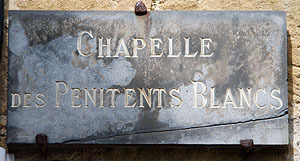 The Penitents Blancs no longer exist in Fanjeaux and nothing remains of their chapel except a modest plaque, though fraternities of Penitents Blancs still exist throughout southern European cities and public self-flagellation is still widely practised during Holy Week. 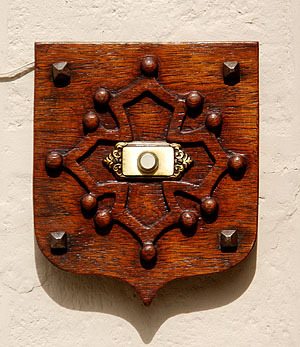 Dominicans are now more discrete about public flagellation and practice "the discipline" in the privacy of their convents. 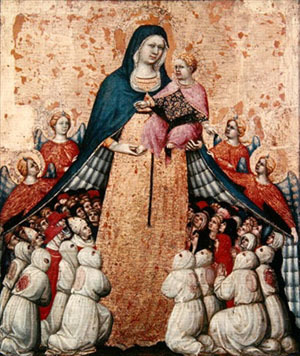 Madonna della Misericordia (detail), 1418-1422 by Pietro di Domenico da Montepulciano, Musée du Petit Palais, Avignon. You can just make out the metal balls fitted to the penitents' flails. Northeast of the parish church, are the remains of the White Penitents chapel, built in 1596. The Lake of Jupiter was drained in 1934.. 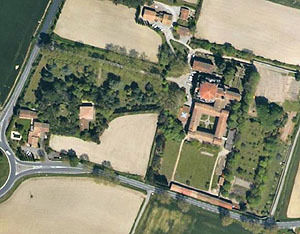 In 1935 the Dominicaines de la Sainte Familles (Dominican Sisters of the Holy Family) moved into the old Dominican Convent in Fanjeaux, on the site of Guilhem Durfort's original castle. 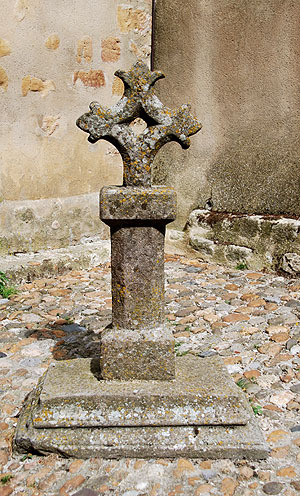 The Cross of Toulouse (the device of the rulers of the Languedoc in the Cathar period, who were excommunicated for their Cathar sympathies) is still popular in Fanjeaux, as it is throughout the Languedoc. 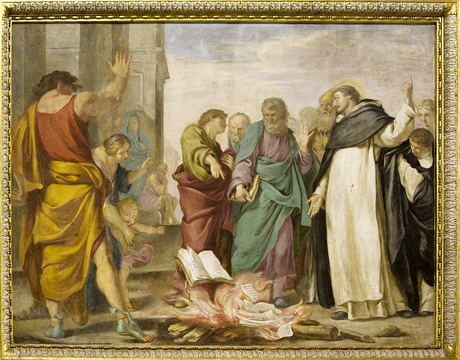 Saint Dominic was a great proponent of the scourge or "discipline" to mortify the flesh. Here he is flagellating himself with iron chains. 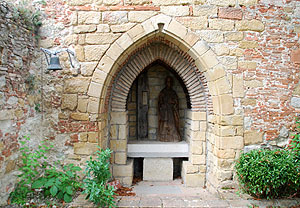 Northeast of the parish church in Fanjeaux, are the remains of the White Penitents' chapel, built in 1596. 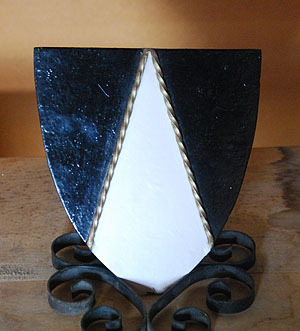 Many secular fraternities of Pénitents Blancs were founded around convents of Preachers (Dominicans) founded by St. Dominic de Guzman. Today almost nothing remains of historical interest. 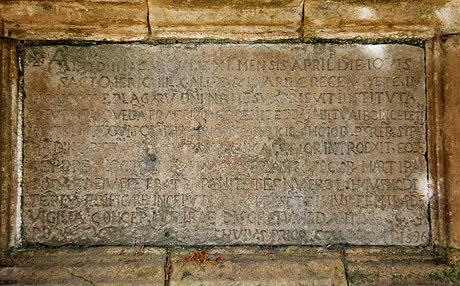 The temple to Jupiter was replaced by a Christian church in early Christian times. 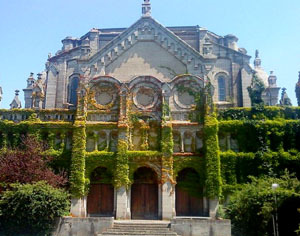 Today, Notre-Dame de l'Assomption stands on the site. 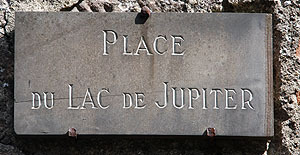 All that remains to show the location of the Lake of Jupiter, or Lake of Jove. Nothing remains of Guilhem Durfort's castle, and almost nothing of the new Royal castle - just a couple of walls of what was once the prison, and an outbuilding where according to legend, Saint Dominic lived. Similarly nothing remains of the castrum walls or of its 14 towers. You can however make out the location of the walls and outer ditch from the road that surrounds the modern village. 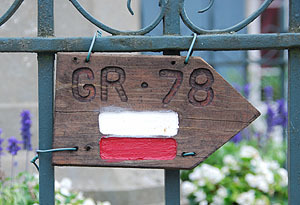 Two entries also mark the medieval town gates. The house of the Parfaites is long gone - even its location is now unknown. 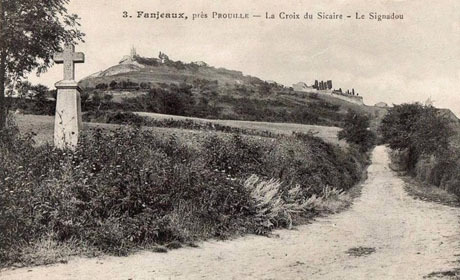 A reminder of where the "new" French castle stood. 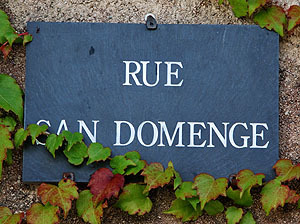 but in Occitan it is Domenge, closer to the Spanish Domingo. 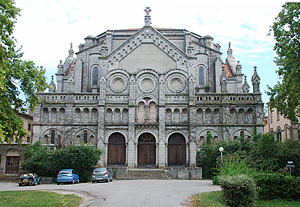 The Church of Our Lady of the Assumption, (l'église Notre-Dame de l'Assomption) is a typical example of Southern Gothic, constructed on the site of the Roman temple of Jupiter. 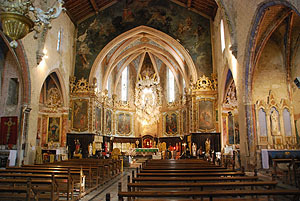 The present church was built in the late thirteenth century (1278-1281). 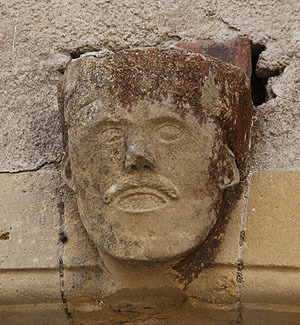 It has some interesting features, notably the Gothic entrance with six arches, a St Roch chapel, and a baroque monstrosity at the east end of the apse in the chancel The foundation stone is set into a wall under the porch. The bell tower is an octagonal tower, pierced by Gothic arches. 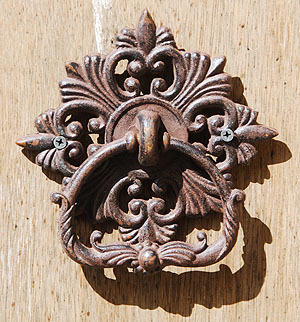 The interior has a remarkable baroque decoration of the eighteenth century. 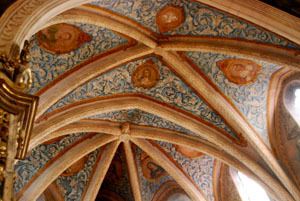 Six vaulted chapels were built between the buttresses. 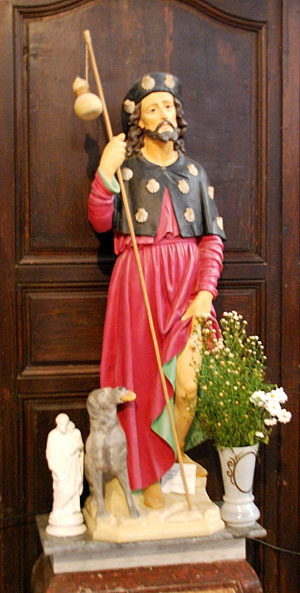 Up until a few years ago, the parish priest of Fanjeaux said mass in Occitan at Christmas and on the feast of St. Roch (or St. Roque) the patron saint of the farmers of Fanjeaux. 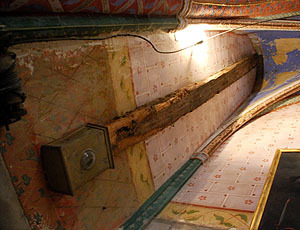 The beam (one of them) scorched during Dominic's miracle of the book (Le Miracle de Feu), now in fanjeaux parish church. 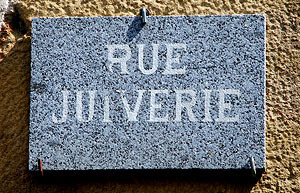 Street of the Jews, a reminder that Jews flourished in the Languedoc during the Cathar period. 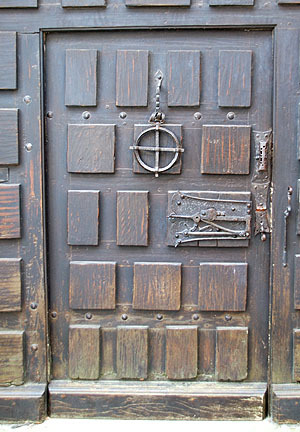 One of the terms of the submission of the Counts of Toulouse in 1229 required by the Catholic Church was that discrimination must be enforced against the Jews. Persecution increased under the more conventionally Catholic Count Alphons de Poitiers, and eventually Jews were expelled altogether. 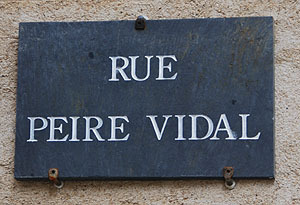 Peire Vidal (born mid-12th century) was an Occitan troubadour. Forty-five of his songs are extant. The twelve that still have melodies bear testament to his musical reputation. 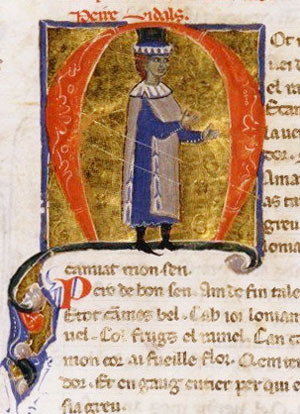 Peire started his career, along with the troubadour Bernart Durfort, at the court of Count Raymond V of Toulouse around 1176. He continued there until 1190, when he left to seek another patron after quarrelling with the count. Many of his early poems were addressed to Vierna de Porcellet, a relative of the Count. In some poems Peire, Vierna and Raymond form a love triangle. From Toulouse Peire went to the court of King Alfonso II of Aragon, where he remained in good favour until the king's death in 1196. He continued to visit the court of Alfonso's son, Peter II In the rivalry between the rulers of Toulouse and Aragon, Peire took the side of Aragon. 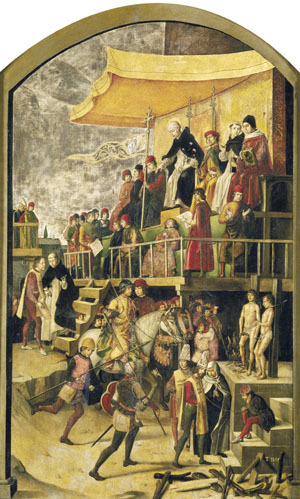 Peire attended the Aragonese court during some of its visits to Narbonne. The famous viscountess of Narbonne, Ermengarde, was a notable patron of troubadours but there is no record that he wrote songs for her. Peire was also associated with Raimon Jaufre Barral, viscount of Marseille and brother-in-law of Vierna. 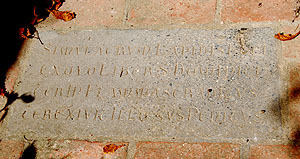 Barral's son-in-law, Hugh of Baux, was also a patron of Peire Vidal. Below is the poem MOs cors s'alegr'e s'esjau by the 13th century troubadour Peire Vidal in the original Occitan, with an English translation, in which Lord (Raimon Jaufre) Barral is mentioned. Troubadours employed distinctive and vary varied rhyme schemes. This one is AAABAAB, not replicated in this English translation. and the true service of love encompass. l sigh and languish and lament. with her brothers and cousins. her sweet smile lingers ever in my heart. and for this reason l will soon be among them. E domneis verais e fis. Qu'ieu no.lh sia bos amis. Plang e sospir e languis. E son cairel el cor mis! Ab fraires et AB cozis. Al cor m'estan siei dous ris. A cui bons pretz es aclis! Per que serai lor vezis. One of Dominic Guzman's first acts in the Lauragais was to establish a house for women he had induced, in ways that are not clear, to abandon Catharism. His new house was clearly modelled on the Cathar Houses for Parfaites. They lived communal contemplative religious lives, supporting itinerant male preachers. The only differences would be that they were no longer free to come and go as they pleased; they would be expected to flog themselves regularly; and they would henceforth require the services of priests as intercessors to God. 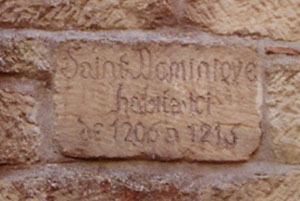 Dominic called himself the Prior of Prouille, but today the establishment is referred at as a Monastery or sometimes as a Convent, but rarely as a Priory. The church at the village of Prouille was the église Sainte-Marie which belonged to Na Cavaers, (co-siegneuress of Fanjeau). 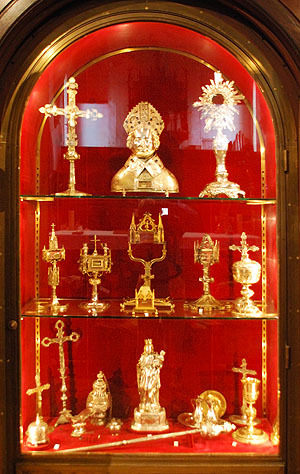 Somehow, we do not know how, this came into the possession of Saint dominic. 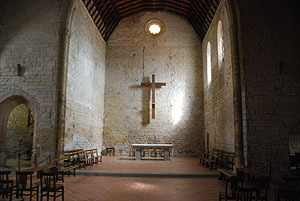 After 1209, the Monastery of Prouille was funded by gifts of land and property by crusaders, often land and property forcibly stripped from local Cathar sympathisers who were left homeless and penniless, and who are known as faidits. We know of many such dispossessed knights. 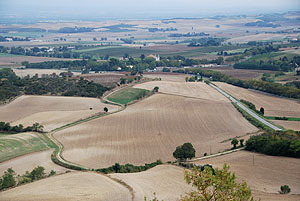 Some such faidits stripped of land in the Lauragais found their way to Montsegur. 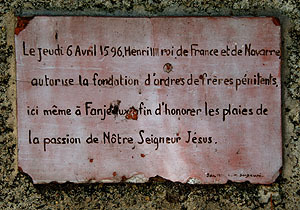 Most notable were the ones, burned alive for heresy at Montsegur 1244: Guilhem de LAHILLE and Bruna de LAHILLE, Bernart de SAINT-MARTIN and Ramon de SAINT-MARTIN, India de FANJEAUX, Jean de COMBEL, Arnaud Des CASSES and Etienne ISARN. Simon de Montfort himself made donations from sequestered properties. For example, on 15 may 1211, ten days after the fall of Lavaur, he gave Prouille a great domaine at Sauzens. His lieutenants followed the lead of their commander, and Prouille grew immensely rich. The nuns lived under the Rule of St. Augustine. Written Constitutions of St. Dominic, drawn up on the lines of the oral Rule of Prouille, were not given until 1220. 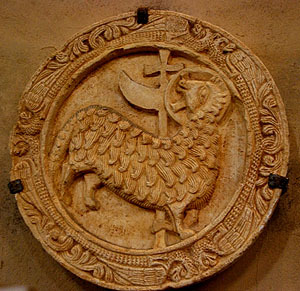 Their text is preserved in a Bull of Gregory IX. (Nov. 1236). They were modified by the fourth Master-General, John the Teuton, and again by his successor, Blessed Humbert de Romans. 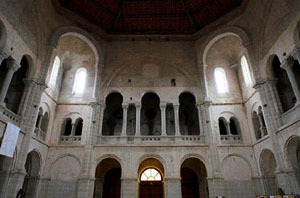 The site for the monastery at Prouille had been indicated by a fire-miracles at Seignadou attributed to Dominic Guzman. 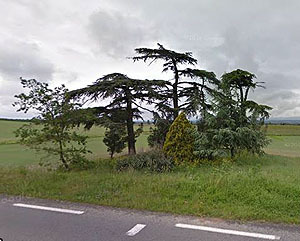 Prouille seems to have provided a regular venue for fire-miracles over the centuries, for it is the site of several unexplained incendiary events. On the night of the 4-5th March 1715 the medieval monastery buildings were ravaged by fire and had to be completely rebuilt. 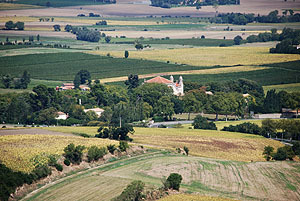 A rebuilt monastery was entirely destroyed again in 1792 at the Revolution, many of its stones later being taken to build houses in Fanjeaux and Bram. 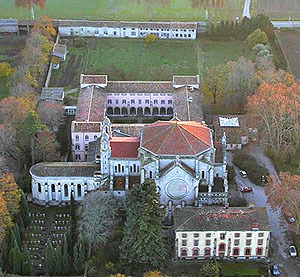 The monastery was rebuilt between 1857 and 1878. Dominican sisters (moniales dominicaines) re-established themselves at Prouille in April 1880. In 1885, they started constructing a basilica in the Romano-Byzantine style (similar to that of Sacré-Cur de Paris). It was never completed. This is a "basilica" in the architectural sense. 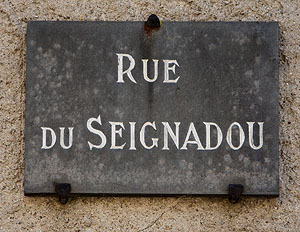 The term is not an honorific, as in the Cité of Carcassonne. On 19 August 1990, another serious fire destroyed the greater part of the buildings but not the unfinished basilica. It still stands unfinished, lacking many features including windows and cupolas. Today, Prouille supports a community of some 30 Dominican sisters, mainly elderly, with younger replacements from third-world countries. The Act of December 1206, by which the Bishop gave to St. Dominic the Church of Our Lady of Prouille and the ground on each side of it for a distance of thirty paces, was probably drawn up in the month of August. It states that Prouille was given to be a home for the women converted by the preachers delegated to preach against the heretics and to repel the pestilential heresy." No endowment was made. The tithes and first-fruits of Prouille were to go as usual to Fanjeaux. The foundation was to be a venture of faith. At the same time it was exempt from all charges, so that if it received nothing it should at least be free from encumbrances. St. Dominic lost no time. Close to the church he built, with a sum of money contributed by Na Cavaers, a little house of rough brick, unpretending but suitable. "He who loved poverty desired that the building should be poor." 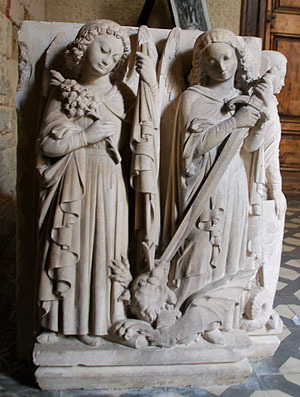 It was speedily finished, and on November 22, 1206, the Feast of St. Cecilia, the eldest daughters of St. Dominic entered the Convent of Prouille. On the Feast of St. John the Evangelist, December 27, Dominic gave them their religious habit  a white tunic, a black veil, a cappa or long cloak of coarse un-bleached wool. It remained thus until in 1218; after the revelation to Blessed Reginald of Orleans, the scapular was added to the habit of the Dominican Order. "The primitive Rule" writes a nun of Prouille of our own day, "given verbally to the Sisters by the holy patriarch, was merely a short resume of the great monastic laws on poverty, chastity, obedience, silence, perpetual abstinence, long fasts, vigils, and the Divine Office. Rigorous enclosure was imposed. Solitude, contemplation, accompanied by work and penance, formed the very essence of the life of the eldest daughters of St. Dominic. They were true contemplatives. But from the first day the Saint gave them a precise aim for their existence of retirement and mortification. Breathing on his children the apostolic spirit which animated him ... he made them in their turn apostles by incessant prayer, by daily immolation. To pray day and night; to offer their prayers and mortifications both for the souls to be saved and for those who were working for their salvation  for himself first, and for all other valiant apostolic workers, past, present, and to come  such was the special end which Dominic the Preacher set before his first-born at Prouille, and in them, before all who were to follow them." It was the Grand Ordre, the Soeurs Precheresses, who prepared the way for the Freres Precheurs [ie the Dominican friars]. 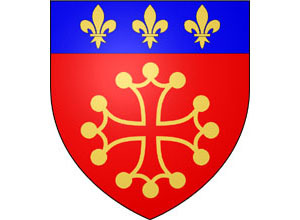 in December of the same year we find Simon de Montfort, from his Parliament at Pamiers, giving a couple of fields at Fanjeaux to his friend, which could be exchanged against ground bordering on that already belonging to the convent. Oddly, the first entrants arrive in 1206, yet the same author has the the miracle that brought the fist nine entrants (the Miracle of the Black Cat and the First Nine Dominican Nuns) occur after the The Colloquy of Montréal in 1207. 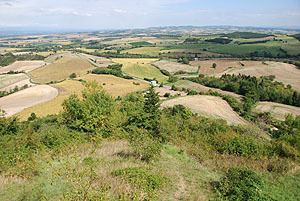 A turn of the road and Montreal comes into view dominating the illimitable plain, all rugged with low hills. 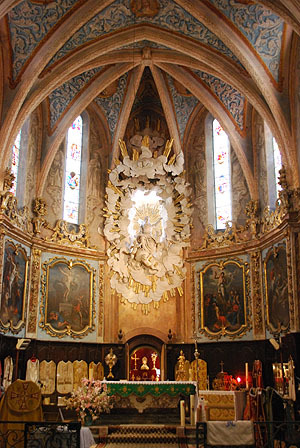 Here, hot and weary, St. Dominic entered for the first time with the Legates on that eventful 24th July 1206, to take part in a Conference which was to last fifteen days. As was usually the case, it was held in the great hall of the castle. 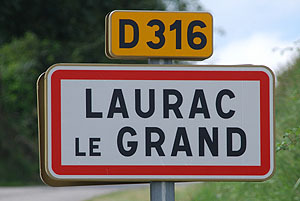 It is suspect on a number of counts, disguising the murder of Lord Amaury of Montreal and his of his sister Lady Giraude of Lavaur, at Lavaur in 1210 - a scandal and a war crime even by the standards of the thirteenth century. Both prisoners of Amaury was summarily hanged and Giraude was murdered by being thrown down a well. Impartial contemporary sources tell us that Lady Giraude was known for her generosity and hospitality. It is also worth noting that in reality the arbiters were invariably either the sponsors of the debate, or selected for their independence and pre-approved by both sides. It is also significant that the Catholic Church was being described as "[the Whore of] Babylon, drunk with the blood of the martyrs and saints of Christ." two or three years before the start of the Albigensian Crusade, which suggests that Cathars were already being heavily persecuted before 1207. The reference is to Revelation 17:4-6 " ... and I saw a woman sit upon a scarlet coloured beast, full of names of blasphemy, having seven heads and ten horns. And the woman was arrayed in purple and scarlet colour, and decked with gold and precious stones and pearls, having a golden cup in her hand full of abominations and filthiness of her fornication: And upon her forehead was a name written a mystery: Babylon The Great, the mother of harlots and abominations of the Earth.. And I saw the woman drunken with the blood of the saints, and with the blood of the martyrs of Jesus: and when I saw her, I wondered with great admiration." 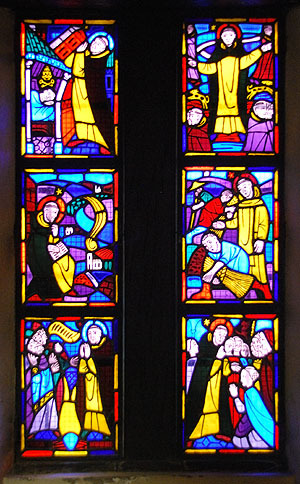 The same connection was later made by Protestants at the Reformation. 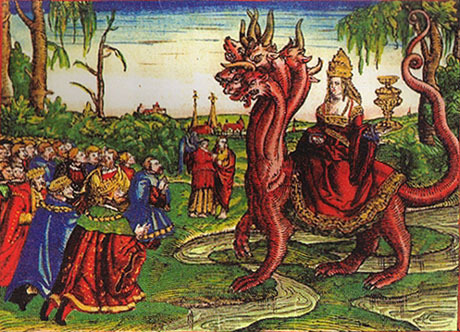 In the illustration below the papacy, representing the Catholic Church, is shown as the great whore of Babylon. 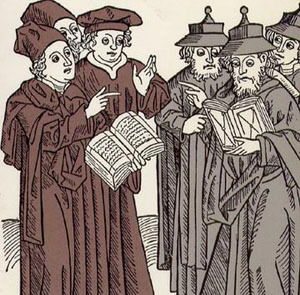 Disputes were part of intellectual life in the medieval period (and still are at ancient Universities). Often with independent judges, sometimes in public. Here Catholics are debating with Jews, just as they debated with Waldensians and Cathars. In each case persecution followed when Catholics failed to win the arguments. Doctors at the University of Paris. Catholics also debated between themselves, at least until the losing side started being burned as heretics. 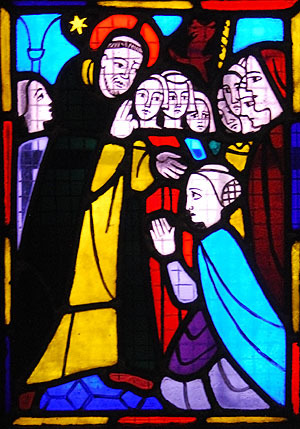 Osma, St. Dominic, and twelve Cistercian abbots, who had answered the appeal of the Abbot of Citeaux, left Carcassonne early to walk barefoot to Montréal, where one of the most important Conferences of their spiritual Crusade was to be held. On the way, about three miles from their destination, they passed a field beside the dusty, shadeless road, where the early harvest was being gathered in. 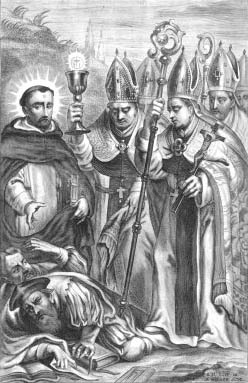 St. Dominic, the first to perceive the reapers (who belonged to the parish of Arzens), rebuked them sternly for working on a holy-day. The men assumed a threatening attitude, and one, standing ready to strike him with his sickle, answered defiantly that it was no holy-day, that the corn must be reaped, and that they intended to do it without interference from any priest. Looking down, the man suddenly perceived the sheaf he held in his hand was red with blood." He thought at first he had cut himself with his reaping-hook, but there was no wound in his hand. 'What can it be? ' he asked the other peasants. Then, all, hastily examining their sheaves, found them also stained with blood, though their hands were scatheless. 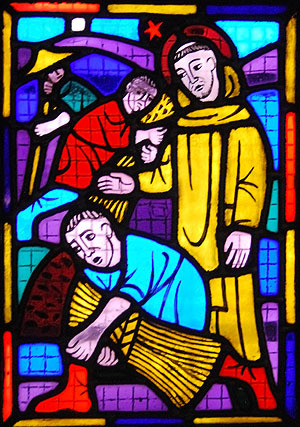 God doubtless permitted this prodigy for the greater glory of His servants in this region, particularly for that of Blessed Dominic." 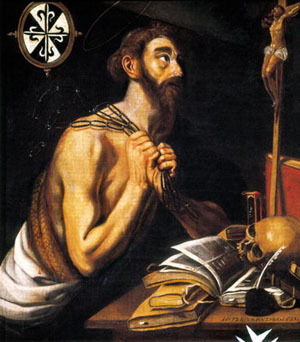 It is interesting to note in this connection that St. John the Baptist was held in horror by the heretics, who looked upon him as an evil spirit and antichrist. 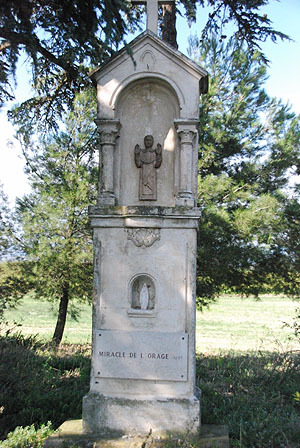 The spot on which the miracle occurred is today marked by a small wayside shrine, erected in 1888 by the V. R. Fr. 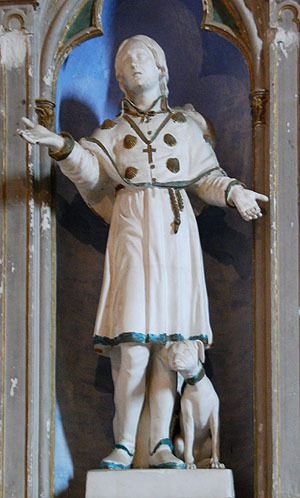 Larocca, Master-General of the Dominican Order, and blessed on 8th October of the same year by the Bishop of Carcassonne, in commemoration of the undying tradition of the " Field of the Sheaves." 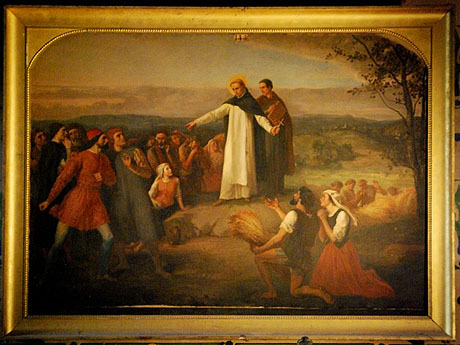 A large picture of the miracle hangs in the Parish Church of Montreal. 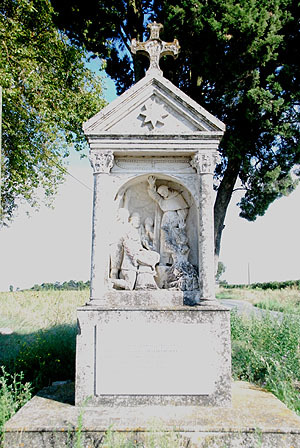 A few hundred yards further on, on the other side of the road, is another shrine commemorating a miracle of later date which took place on one of St. Dominic's many journeys between Montreal and Carcassonne. It is known as the Miracle of the Storm. The Saint was preaching one sultry afternoon to a group of peasants working in the surrounding fields and vineyards, when the muttering of thunder was heard, the heavy sky grew dark with clouds, and began to pulse with lightning. One of the sudden, terrible storms which so often destroyed a harvest in half an hour was about to break. 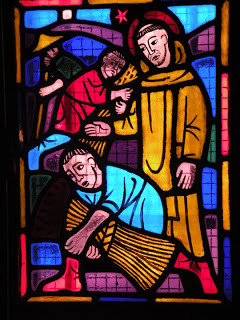 His hearers implored Dominic to pray that the tempest might be averted. He bade them not to fear, for not a hair of their heads would be wet with the rain, which had begun to fall in torrents a little way off, and that none of their crops should suffer from it. They remained till his sermon was finished, and departed, untouched by the storm, to find that the Saint's prophecy had been fulfilled, and that their fields had taken no harm. 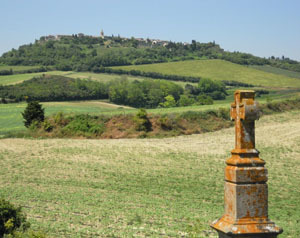 According to local tradition, no rain has fallen ever since on the spot, now marked by a tall cross surmounting a shrine, round which is planted a little grove of cypress and yew. Wreathed in trails of flowering periwinkle. 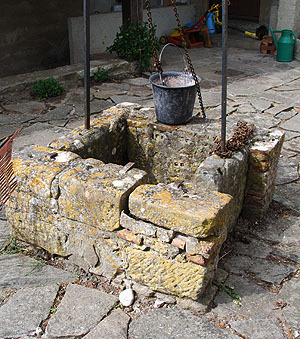 It is perhaps one of the most beautiful, though one of the least known, Holy Wells in the world. Here Dominic and his companions would turn aside from the dusty road to rest by the fountain beneath the spreading trees, and there slake their thirst ; "for," says Gerard de Frachet, "when the Saint, weary and harassed with cares, was going to stay in a house belonging to seculars, he first drank deeply at some fountain or neighbouring spring, fearing lest his thirst, increased by the fatigue of the journey, should scandalise his hosts. For his liveliest fear was ever that he might become an occasion of scandal to those around him ; this he dreaded above all. "The ice-cold water  to which have often been ascribed miraculous properties  is still as deliciously fresh and clear as it was in the time of our Saint, springing from the heart of the limestone rock. The tradition that rain never falls on the spot cannot be wholly reliable, since rain fell there on the day that the adjacent photograph was taken in September 2014. 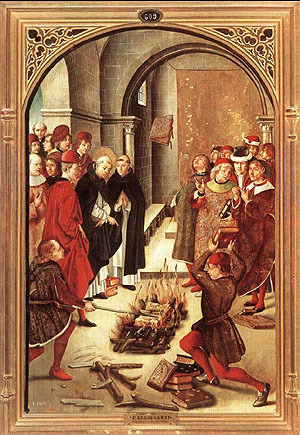 One legend relates that when Dominic's followers threw his speaking notes into a fire after The Colloquy of Montréal, the text proved so holy that the flames would not burn them. The papers flew up into the air. 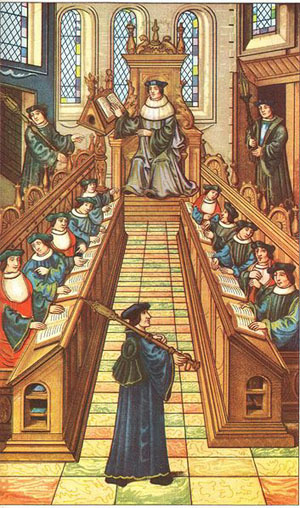 In later versions Dominic challenged Guilhabert de Castres in public during the course of the debate. 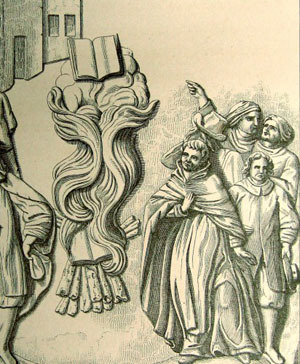 Catholic and Cathar books belonging to Dominic and Guilhabert were both thrown into a fire. Dominic's survived the flames hovering in the air above the fire, while Guilhabert's burned like any other book. 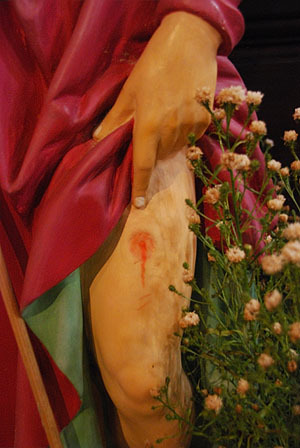 There are a number of increasingly impressive accounts of the miracle. In this version below the author has conflated the The Colloquy of Montréal with the earlier legend of events in Fanjeaux, concealing the failure to win over the independent judges at Montréal and simultaneously providing an excuse for burning other people's books. "One day a famous disputation was being held at Fanjeaux and a large number of the faithful and unbelievers had gathered. Many of the former had written their own books containing arguments and authorities in support of the faith. After these books had been inspected, the one written by Blessed Dominic was commended above the others and unanimously accepted. Accordingly, his book and that produced by the heretics were presented to three judges chosen with the assent of both sides, with the understanding that the side whose book was chosen as the more reasonable defense should be regarded as having the superior faith. After much wrangling, the judges came to no decision. Then they decided to cast both books into a fire and, if either of them was not burned, it would be held as containing the true faith. So they built a huge fire and cast the books therein. 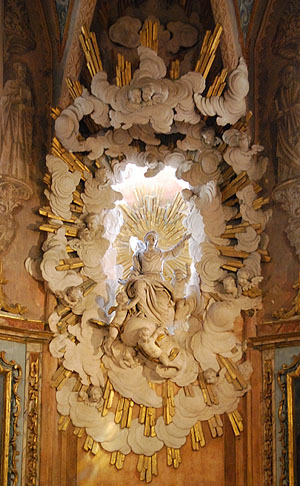 The heretical book was immediately consumed by the fire, but the one written by the man of God, Dominic, not only escaped burning, but, in the sight of all, leaped far from the fire. For a second and a third time, it was cast into the fire, but each time it leaped back and thereby openly testified to the truth of its doctrine and the holiness of the person who had written it." From the Libellus of Blessed Jordan of Saxony. In yet later versions all this took place before impartial judges who unanimously agreed that Dominic had won the debate. In yet another form of the evolving legend, the episode had evolved into an ordeal by fire in which Dominic's text lodged on a roof beam visibly singeing it. 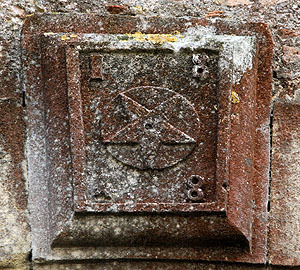 Several sites in Fanjeaux, including the village church and a Dominican chapel claim to posses the very beam, still bearing its miraculous burn marks. 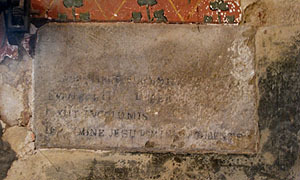 One beam from the 'Miracle of fire' is now in the parish church where the inhabitants of Fanjeaux carried it in 1820 after the collapse of the chapel where the miracle had taken place. 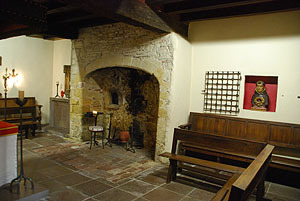 This chapel was located at the Preaching Brothers' convent. 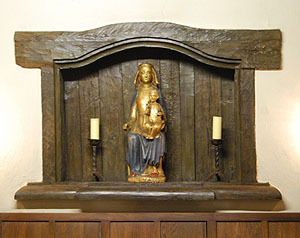 The Preaching Brothers' convent now belongs to the Dominicaines Des Sainte Famille, who miraculously, also possess the beam from the Miracle of Fire, housed in its own "chapel" - more like a small external niche. It is reported in the supplement of the council of Nicaea that the fathers, being very perplexed to know which were the cryphal or apocryphal books of the Old and New Testaments, put them all pell-mell on an altar, and the books to be rejected fell to the ground. It is a pity that this eloquent procedure has not survived. 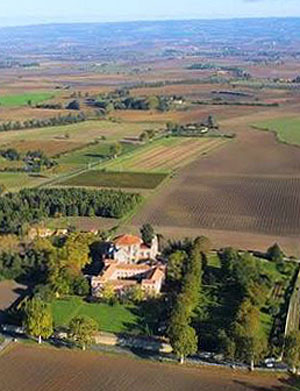 The following Catholic account relates how the Château de Durfort was sold to Dominicans, who had a chapel there - on the site of the hall where the miracle of the book supposedly occurred. When the Château and its hall were destroyed by the Black Prince a few years later, a Dominican monastery (with a new chapel) was built on the site. This Gospel emerged safe from the greedy flames. 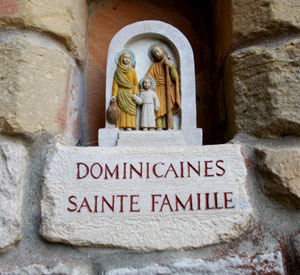 Today the building is owned by the Dominicaines de la Sainte Famille and they have their own "Chapelle du Miracle". 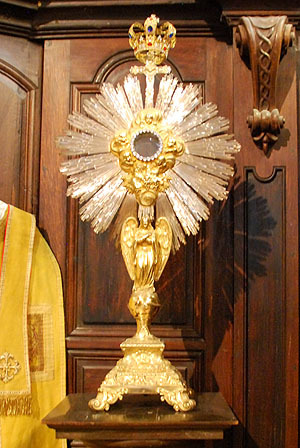 Both Church and Chapel purport to have not only the beam, but also the hearth stone on which the miracle occurred. 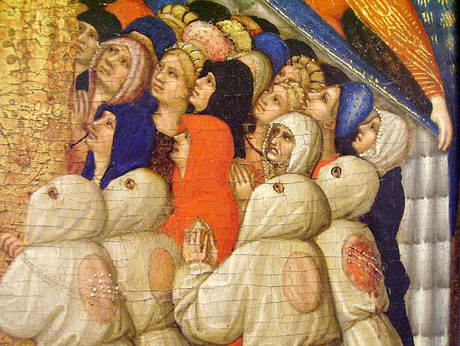 Detail of The Coronation of the Virgin by Fra Angelico, executed around 1434-1435, now in the Musée du Louvre of Paris, France. 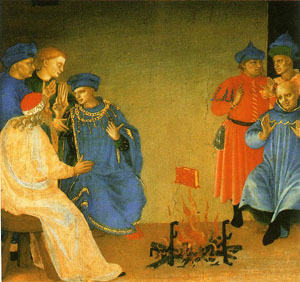 In this cartoon strip version Dominic gives the Carthars a Bible, which they try to burn, but the Bible hovers above the fire. Detail of The Coronation of the Virgin by Fra Angelico, executed around 1434-1435,now in the Musée du Louvre of Paris, France. In this version, Dominic is not even in the room where the miracle takes place. 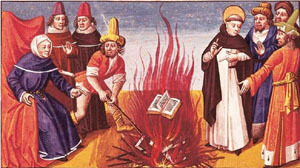 Saint Dominic burning the books of the Albigensians, miniature from Le Miroir Historial by Vincent of Beauvais, manuscript, France 15th Century. Chantilly, Château, Musée Condé (Picture Gallery And Art Museum). 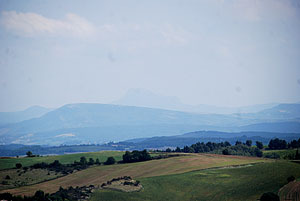 Le Seignadou is a promontory in Fanjeaux, with a panoramic view of the Black Mountains, Mount Alaric and the Pyrenees. 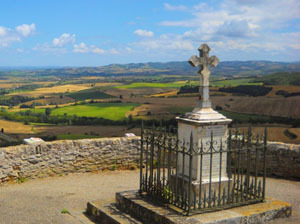 Saint Dominic claimed to have experienced one of his many miracles here - he experienced a surprising number of unremarkable miracles (like seeing off a black black cat). This one sounds remarkably similar to witnessing a case of ball-lightning. Ball lightning tends to occur in certain places in volcanic areas, which might also account for the fact that the monastery keeps burning down inexplicably. In any case, for Dominic it was a miracle and he was convinced that God was telling him where to found his new monastery. He saw the the fire-ball at the tiny village of Prouille, so it was Prouille that he appropriated for his new monastery. 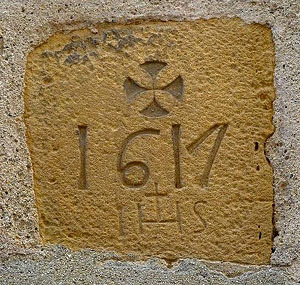 The name of the promontory from which he witnessed the fireball, comes from Senhador, Occitan for "sign of the Lord". Here is a Catholic account of the miracle. 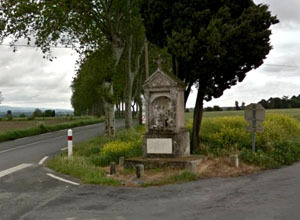 On the night of 2ist-22nd July 1206, the eve of the Feast of St. Mary Magdalene, St. Dominic passed through the village towards the spot, which has ever since been called the Signadou. Just beyond the spot where the north gate then stood, a jutting angle of rock from which the ground falls away on two sides in a precipitous descent, forms a wide shelf from which a marvellous view may be gained. And it was at night that St. Dominic continually came hither to pray for the souls he was seeking in this fair country unrolled like a map beneath his feet. Suddenly, as he gazed out into the night, he saw a globe of fire like a meteor dart from the star-sown sky and circle thrice over a spot not a mile from the foot of the hill on which he knelt. Then it fell upon the ground and rested there. He knew it for what it was  the Sign of God for which he had so greatly longed, for which he had scarcely dared to pray. On the spot where it had fallen his convent was to rise. Realising this clearly, thanking God with all his heart, he yet prayed with holy prudence that if it were really what he believed, the fire might again fall from Heaven a second and a third time, that he might know of a surety that it was the spot which the Lord had chosen. His prayer was granted. Returning on the two following nights St. Dominic again saw the same prodigy, and understanding, took courage. He had recognised the spot by the light of those southern stars, and knew well to whose intercession he owed its choice. 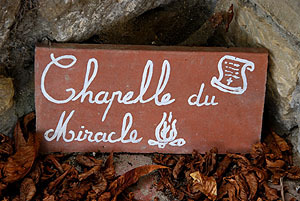 For the Sign of God had fallen upon the little sanctuary of Notre Dame de Prouille. 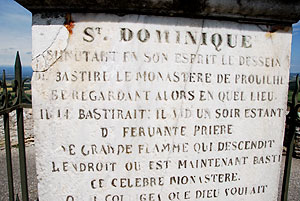 "Saint Dominique minutant en son esprit le dessein de has tire le Monastere de Prouille et regardant alors en quel lieu il le bastirait, il vid UN soir, eslant en fervente priere une grande fiamme qui descendit a Fendroit ou est maintenant basti ce celebre Monastere ; d'ou il colligea que Dieu voulait qu'ilfitt basti en CE lieu qui avait ite honori du feu du del. Les habitans dudit Fanjeaux esleverent en memoire et a Vhomieur de CE grand Saint UN oratoire qui s'appelle le Seignadou dans laquelle il y a une croix de pierre blanche." [my loose translation: "St. Dominic contemplating in his mind the construction of the Monastery of Prouille and overlooking a possible places to build it, spent a night in fervent prayer, and saw a great fiamme descend at the place where this famous Monastery is now built; from which he deduced that God wanted him to build on the spot honoured by fire from heaven. 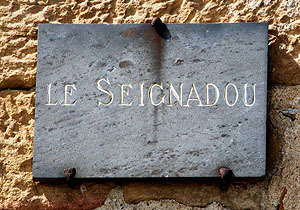 The inhabitants of Fanjeaux raised in memory and honour of this great Saint an oratory called the Seignadou, in which there is a cross of white stone.] 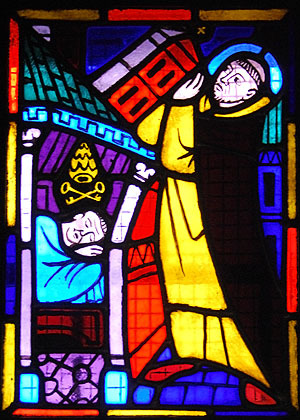 "
" Deus vos benedicat et liber et a fulgure et tempestate"
No chronicle relates any of the compelling arguments that Dominic used to convert those he considered "heretics". As at Montréal, and in the "field of the sheaths", this deficit is made good by a convent miracle of the sort that impressed medieval Catholics, but modern theologians not quite so much. It may be that these miracles conceal the fact that no genuine voluntary converts were made at all. 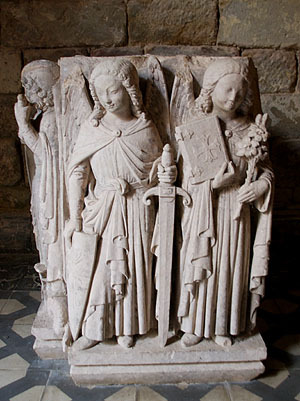 There were at most very few converts, even according to primary Catholic sources, and their conversions might well have been secured by force (as they certainly were after 1209, when refusal to recant was punished by death, as at Lavaur and Minerve). 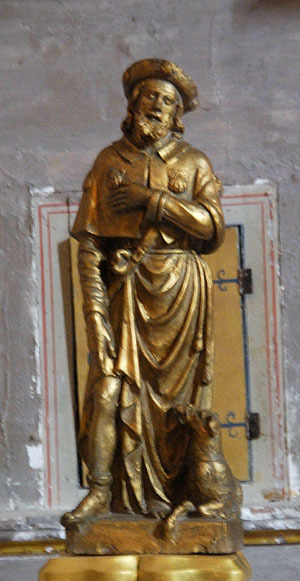 Here is a sympathetic Catholic account of how Dominic secured the conversion of nine young women who had been educated by Cathars at Fanjeaux. 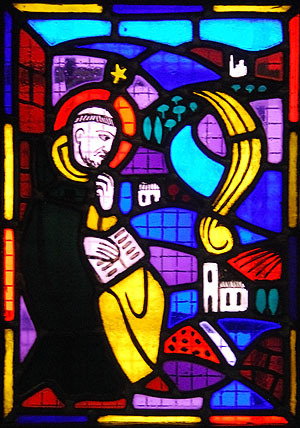 A few days after the Conference [The Colloquy of Montréal], St. Dominic, after an evening sermon in the open air  probably in the market-place  to the greater part of the people of Fanjeaux, entered the little church hard by to spend an hour in prayer. As he knelt there the door opened, and a group of young women approached him as the Greeks of old came to St. Philip, with that petition on their lips which is the unuttered, unconscious cry of the world: "Sir, we would see Jesus." Falling at his feet, they begged this new apostle to guide them. "Servant of God," they exclaimed, " help us ! If what you have preached today be true, we have long been deceived by the spirit of error, for up till now we have always believed in the Good Men whom you call heretics. We have always held to their doctrine, and now your sermon leaves us in cruel uncertainty. Servant of God, we beseech you, pray that the Lord will make the true Faith known to us, because in that Faith we desire to live, to die, and to be saved." He rose from his knees. The hour had come perhaps sooner than he had dared to hope ! Here were the first-fruits of his preaching ; here was the first sheaf of that world-wide harvest which was to be garnered in his Threefold Order. There in the old church built by a more faithful generation Dominic spoke burning words of courage and counsel to these young souls who had come to him for help. They were nine, all pupils of the Parfaites, of good family, eager to hear the truth. How could he help them? It was easy to speak, to instruct and answer questions, but how could he protect them when they went back to those enemies of the Faith, who would instantly strive to root up the good seed, to undo all that he had already done? One thing was certain: if he wished to preserve his converts he must take them completely away from their surroundings; he must provide them with a refuge into which no heretic could penetrate. As he spoke to the young girls, these thoughts kindling in his heart, a truly nerve-shaking apparition rushed upon them out of the shadows. A hideous nondescript animal "of terrific size," catlike, with savage eyes and formidable claws, a creature " as black as the chimney of hell from whence it issued," burst into the church, to the terror of the women, and for the space of an hour circled round them in a manner which, judging by the ancient chronicles, must have been as alarming as it was revolting. Finally, after uttering horrible cries, with one mighty bound the demon rushed up the bell-ropes and disappeared in the darkness of the tower, leaving behind him an odour so terrible " that not all the balms of Arabia could overcome it." "See," said Dominic, "you can judge by this apparition which God has permitted, of him whose slaves you have been until now." Before they left him his visitors declared their firm faith in his doctrine, and their resolution to be guided by him in future. Dominic bravely seeing off a malodorous, black, catlike, demonic apparition of terrific size with savage eyes and formidable claws - which escapes up the bell-rope. In later versions of the legend the nine young women become established Parfaites, making the miracle even more impressive. 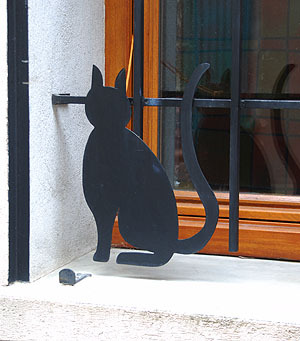 Soon afterwards, the Inquisitor Conrad of Marburg - an infamous torturer - reported that he had uncovered a satanic cult which worshiped the devil and a diabolical black cat. 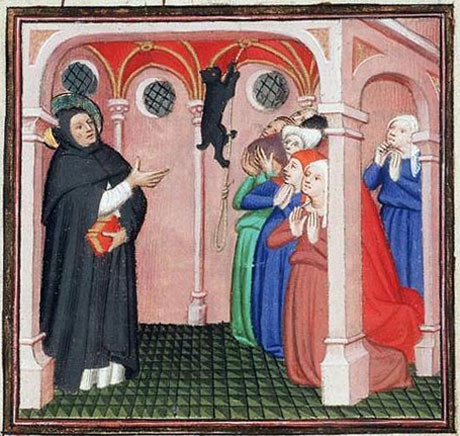 Inexplicably, Dominic's Miracle of the Black Cat, once so famous, receives very little publicity today, although demonic black cats went on to be successively implicated not only with Cathars, but "Lucifarians", Knights Templars, witches and other "heretics" up the Enlightenment. 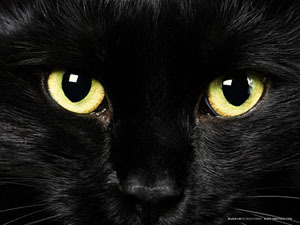 The fantasy of the evil role of black cats was to be further formalised a few years later. Pope Gregory IX issued a bull, Vox in Rama (A voice in Rama) condemning a supposed German heresy known as Luciferianism, imagined to be a form of devil worship. The bull was issued to King Henry, son of Emperor Frederick II, in June 1233 and subsequently also to Archbishop Siegfried III of Mainz demanding the use all efforts to stop the practice. The Bull was largely inspired by reports from Conrad of Marburg. It describes in detail the initiation rites of the sect, featuring a toad as large as a dog, an emaciated pale man, a communal meal, and the statue of a black cat that would come to life, and which would be kissed on the buttocks. After the ritual was over, the candles would be extinguished and the sect would engage in wild homosexual orgies. When eventually the candles were relit, a man from a dark corner of the room appears "from the loins upward, shining like the sun. His lower part is shaggy like a cat". After a litany-like dialogue between the cat and the cult members, the meeting concludes. Like Dominic's miracle, this Papal Bull has been heavily downplayed since the early twentieth century, to the extent that populist Catholic websites now regard it as a fraud, though historians of repute still cite it as genuine. A resident near the church at Fanjeaux has created an image of a cat-like demonic apparition which sits on his windowsill. 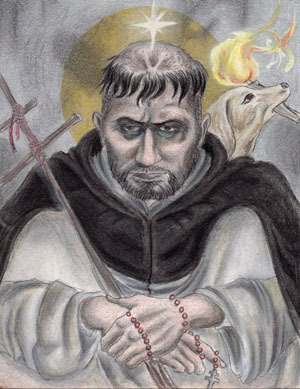 "It is because St. Dominic was pre-eminently a warrior, because he was rigid and uncompromising as regards the things of God, that he is looked upon as a forbidding, frowning figure by the historian." 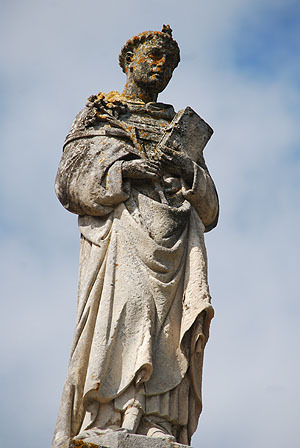 Saint Dominic by Oswulf. 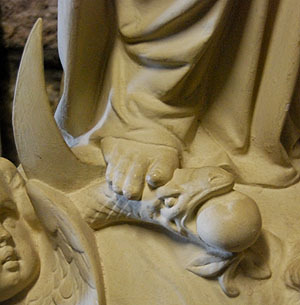 In Catholic art, Saint Dominic is recognisable by a star over his head as well as his saintly auriole. 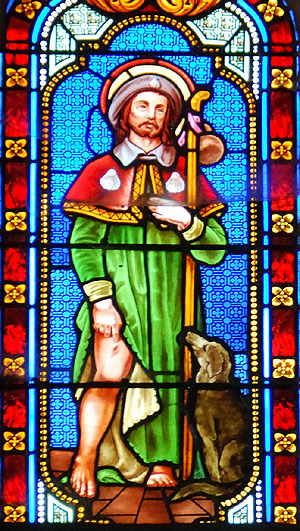 He is generally accompanied by a dog with a lighted torch in its mouth, and is often shown carrying a chaplet of beads. According to a story invented long after his death, the Virgin Mary gave him such prayer beads during the Battle of Muret in 1213. 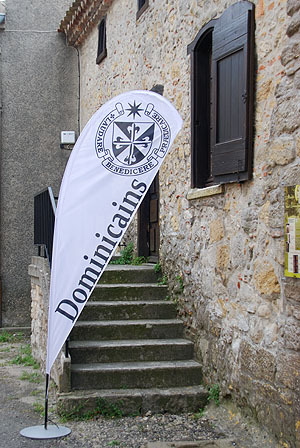 Once again a miracle permits Dominic to make conversions without having to produce an argument or refute the arguments of the Cathars. Here, he engages a group of peasant "heretics" working in the fields who are unimpressed by his preaching and tell him to go away, he refuses and eventually they threaten to kill him. He welcomes martyrdom, and asks them to torture and mutilate him as well, which causes them to lose heart and they suddenly see the light. The fervent desire for torture and martyrdom is a characteristic of many, perhaps most, medieval martyrdom legends. As in all of these miracles, they improve over the centuries so we always have a number of different versions - The miracle of the Storm may well preserve an earlier version of the same story. In the version below the the peasants have mutated into dedicated assassins, though they still carry their farming equipment. 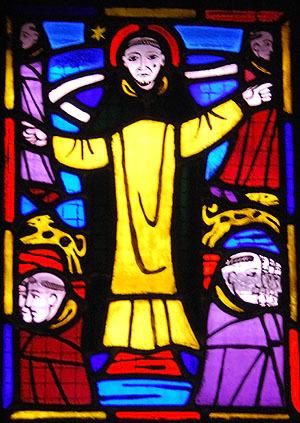 Everyone knows the story of the would-be murderers who laid wait for St. Dominic, knowing well which way he would come, as he descended the hill of Fanjeaux one night after a long day's work, returning to his brethren at Prouille; how as he came  alone  they were smitten with awe at the sight of him, and their weapons  the harvest implements of peasants  fell from their shaking hands; how they cried out to the Saint, asking him what he should have done had they rushed upon him as they had intended, and his heroic answer: "I should have prayed you not to kill me with a single blow, but to prolong my martyrdom by cutting off my limbs one after another, so that I could see them before me; by then putting out my eyes; and, finally, by leaving all that remained of me still living bathed in my blood. For thus I should have gained a more glorious crown." It was here, on this very spot, he spoke those words. 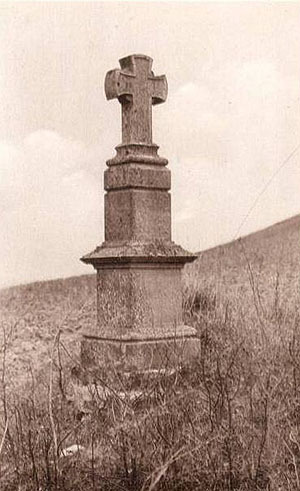 This cross, which bears no inscription, renewed throughout the centuries, has stood here ever since. 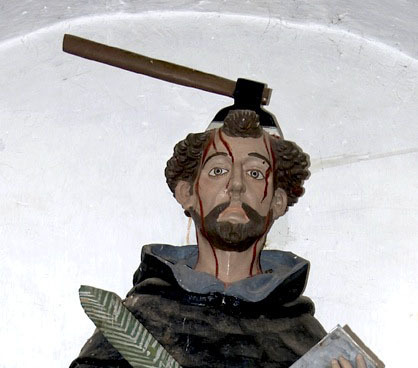 According to modern Dominicans, Saint Dominic also sought out humiliation in place of martyrdom. Brother Dominic always hoped to be martyred but thought himself unworthy. So he fled places of honor and drew near to mistreatment, where people would spit and throw filth at him. You might notice that the Cross of Sicaire that marks the very spot of the assassin miracle is itself miraculous. At different times it takes different forms and stands in different places. See the photographs above. 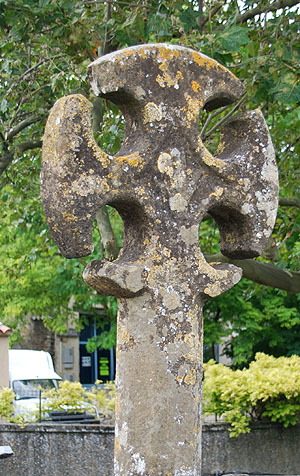 There is another Cross of Sicaire outside the church in Fanjeaux. Genuine murder attempts against Dominican Inquisitors were generally successful, as at Avignonet in 1242. In Italy the much hated Dominican Inquisitor Peter of Verona was murdered in 1252 and is now known as Saint Peter Martyr. He is generally shown with a cleaver through his head. 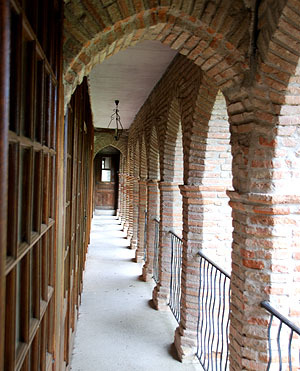 This photograph shows an image of him in the Cloister of San Pedro de Verona, Villa de Etla, Oaxaca, Mexico with an axe rather than a leaver. 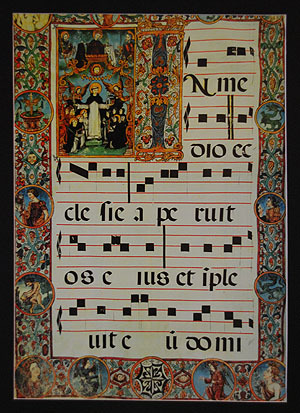 Paper presented at a meeting of the International Commission of the Dominican Order, Prouilhe, France, April, 2006 celebrating the coming 800th anniversary of the foundations of the Order, largely about the founding of Prouilhe. 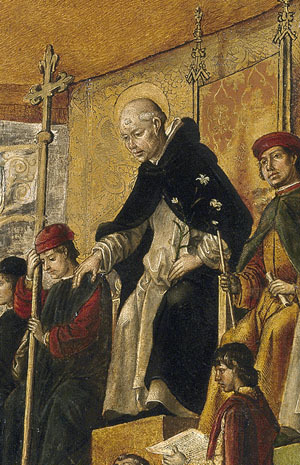 Dominic's "Miracle of the Book"
Detail of a Panel showing Saint Dominic, part of the large 'Demidoff Altarpiece' made for the high altar of San Domenico in Ascoli Piceno, east central Italy.Dominic wears the winter uniform of his order, a white habit and black cloak. 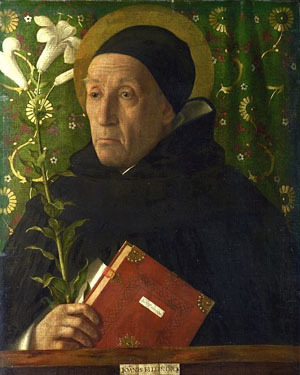 The attributes that identifiy him as Saint Dominic are the lily (a symbol of chastity), and the book (which refers to his role as instructor). 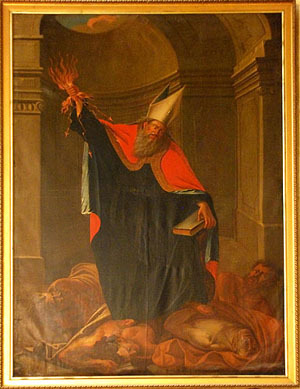 Saint Augustine of Hippo, an ex Manichaean, trampling other Manichaeans underfoot. 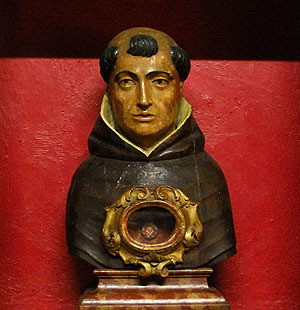 Like Sain Dominic, Saint Augustine is sometimes referred to as the Father of the Inquisition. representing Saint Dominic's miracle de la cédule. and the First Nine Dominican Nuns. 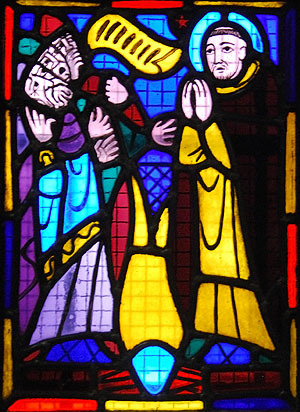 Stained glass window in the "House of Saint Dominic" in Fanjeaux. Saint Dominic sends out his followers in pairs (like the apostles and the Cathars). 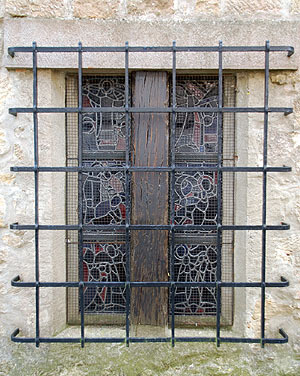 Stained glass window in the "House of Saint Dominic" in Fanjeaux. 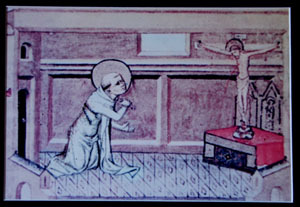 "Saint Dominique habitat ici de 1206 a 1213"
Saint Dominic fagellating himself in front of a statue of the crucified Jesus which squirtis blood from His wounds - one of Dominic's nine modes of prayer - shown in "St Dominic's House" in Fanjeaux. 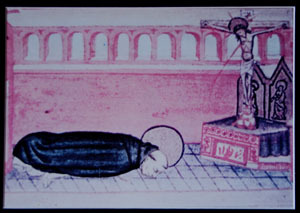 Saint Dominic prostrating himself before a statue of the crucified Jesus squirting blood from his wounds - one of Dominic's nine modes of prayer - shown in "St Dominic's House" in Fanjeaux. The National Gallery, London. 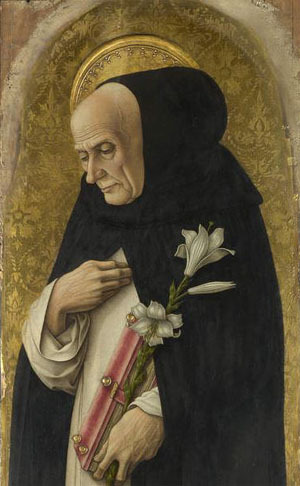 The attributes that identifiy him as Saint Dominic are the lily (a symbol of chastity), and the book (which refers to his role as instructor).